Increasingly over the last few years, I have celebrated holidays virtually. Far from a lonesome tradition, I have come to truly enjoy the annual Pilgrim's Bounty in Azeroth, and there is always a crowd. I have also come to depend upon the Web for traditional recipes, such as the one for the green bean casserole my mother made when I was growing up. 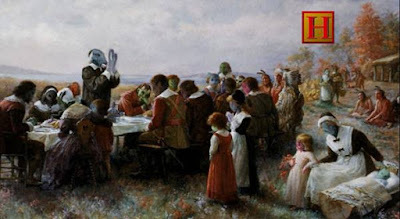 The history of Thanksgiving is complex and muddled, and much of it has been overshadowed by misconceptions regarding its origin. While the details surrounding it are tragic and lamentable, it has mostly come to represent a coming together of families... and eating too much, and American football. Thanksgiving programming is sometimes scarce, unlike Christmas. Of course, South Park has covered just about every holiday - including both Thanksgiving and Black Friday. If you prefer more traditional Thanksgiving programming, maybe Jack Benny is the turkey you're looking for. Christmas also bests Thanksgiving in carols, but there is at least one great Thanksgiving theme song. Hopefully these links and resources will help you and yours have a happy Thanksgiving!